I finally had a few hours to sit and read the blogs I've bookmarked and now I feel completely lost and inadequate. While I was baking in the sun you all were quilting and sewing and writing books and knitting and posting free patterns, and fabric is on sale, and I don't even know what else. How am I ever going to read everything, follow all the links, and remember the really cool projects and ideas? Sigh ... Well, even though I'm totally lost right now I know catching up will be fun! I do need to do something crafty. I got my sewing machine out to work on my quilt top but instead of doing that I got sidetracked in blogland. So now off to the wonky-feeling quilt, which will be backed in orange(!?!) ... still not sure of the binding though. We pulled out a laptop recently and found a whole bunch of old pictures on it, it has been so fun looking at them! 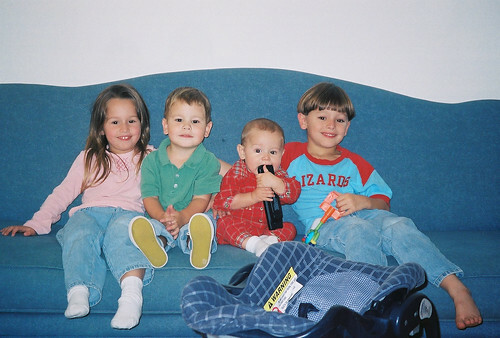 Here's one of four of the kids from 2004 (I'm not sure where C was when this was taken, even though she's the oldest she's the one who has changed the most over the last few years), I cannot believe how much they've grown!